Are you joining the club of married American-British couples? If so, it’s pretty fabulous. You will be joining the ranks of Mrs Hilton-Rothschild (pictured), George & Amal, Catherine Zeta-Zones & Michael Douglas, and many others who recognise that a transatlantic love is a great one! Two weeks ago, I posted the first of this three part series on planning an American-British wedding in the UK. Today, I am back with part two and am here to discuss the tricky world of stationery, guest logistics, and money! If you are planning an American-British wedding, please leave a comment at the end of the blog and let me know what you think! Save the dates are completely customary in the US and are becoming much more popular in the UK as people get busier and more weddings require the booking of air travel and accommodation. Whenever a wedding requires guests to make travel arrangements, to take days off of work, or falls during a busy holiday period (e.g., bank holiday, Christmas, 4th of July, etc. ), a save the date should absolutely be sent. Thus, for couples getting married in the UK and asking that guests travel from the US, it is imperative that a save the date is sent, usually six months to one year in advance. At the time your save the date is sent, have your wedding website ready and printed on the card so that guests can easily get more information when they need it. No detail is too small in planning a wedding! British usage favours omitting the full stop in abbreviations which include the first and last letters of a single word, such as Mr, Mrs, Ms, and Dr. American usage prefers Mr., Mrs., Ms., and Dr. with full stops. No matter how you feel about wedding websites, if you are hosting an international wedding, having one is vital. From travel logistics to accommodation choices, having a wedding website will save you hours of answering guests’ questions and will help your guests enormously with organisation. You can collect RSVPs via your website (saving the hassle of international postage), avoid the postage of information cards (saving you the printing cost in your invitations), and update periodically (so you can make changes and easily tell all your guests at once). You can also post videos and photos on your website after your wedding to share with your guests. Depending on your budget, you can have a custom website created to coordinate with your stationery or you can use one of many free options to create your own. As mentioned above, when you send out your save the dates, the URL should be listed. In the UK, it is common (though becoming less common) for couples to extend two separate types of invitations. One set of invitations will be for the entire wedding day (ceremony, dinner, and evening reception). The second set of invitations will be for the evening reception, after the wedding breakfast has finished, only. Most Americans find this practice rude and would be offended at the thought of receiving an evening-only invitation. However, the British are perfectly accustomed to this practice. I would always advise against sending an overseas guest an evening invitation. It simply isn’t polite to ask them to travel to your wedding for the evening portion only. Dress codes vary between the US and the UK for weddings. For more on UK dress codes see Debrett’s. For US dress codes, see Emily Post. Remember, dress codes should not be mentioned on your invitation unless they are unusual. They can be put on an information card and included with your invitation or listed on your wedding website. Here is my nifty chart to simplify things! White tie: This is rarely used except for the most formal occasions in both the UK and US. For men, it consists of a long black jacket with tails and white vest and bow tie. For women, a floor-length evening gown is acceptable. Black tie: This is more commonly used in the US than the UK but is perfectly acceptable in the UK as well. It is a very formal (only less formal than white tie) and generally consists of a tuxedo (called the “dinner jacket” in the UK). Highland dress (i.e., a kilt) worn with a bow-tie is also acceptable. Women should wear an evening gown or at very least a dress below mid-calf. Formal or Black Tie Optional: This is slightly less formal than black tie. A tuxedo is not required but the event is still formal enough that it would be acceptable. Thus, a tuxedo or formal dark suit would be appropriate. For ladies, a cocktail dress or long dress would be appropriate. Typically black tie is reserved for evening weddings. Morning dress: Morning dress is much more common at UK weddings and is used for daytime formal events. For men it consists of a morning suit. Scottish Highland dress (i.e., a kilt) is also acceptable. Women should wear smart day wear such as a dress or skirt with a jacket. Highland Dress: Scottish or highland dress is an alternative to formal British dress. It can be worn in Scotland or in other locations for formal occasions. It includes a kilt, jacket, plain white shirt, and sporran. Hats: Women commonly wear hats or fascinators to weddings in the UK. Many times hats will be mentioned in the wedding’s dress code. Cocktail attire: This is a US term for and is similar to “lounge suits”. It denotes a party atmosphere rather than business atmosphere. Lounge Suits: Lounge suits indicate a dark suit. For women, a smart or cocktail dress is acceptable. In general, this is less formal than morning dress but still a neat, tailored look. Casual or Informal: A casual dress code indicates a wedding will be held outdoors, in a pub, or in another laid-back venue. For men, dress pants or khakis and a button-down shirt is appropriate. For ladies, a sun-dress is perfect. In the US, the bride and groom’s attendants usually pay for all of their own attire. In addition, the bride’s attendants will usually pay for the cost of professional hair and make-up. 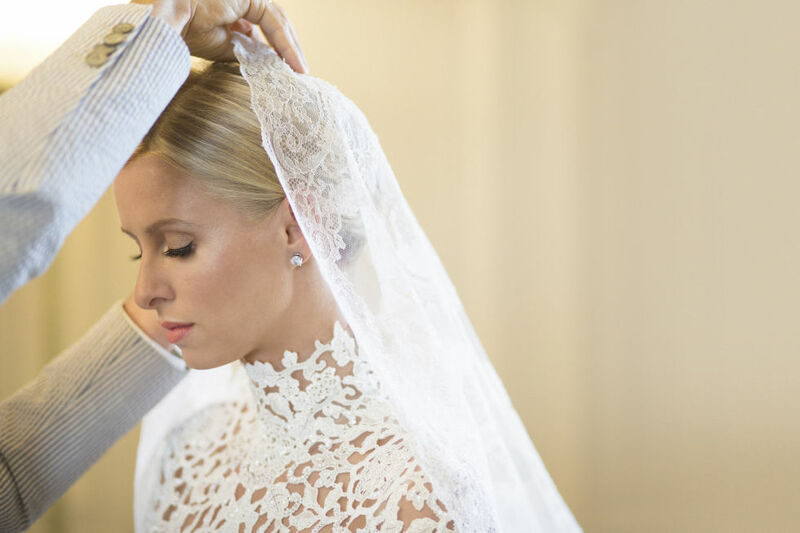 In the UK, these costs are traditionally the responsibility of the bride and groom. 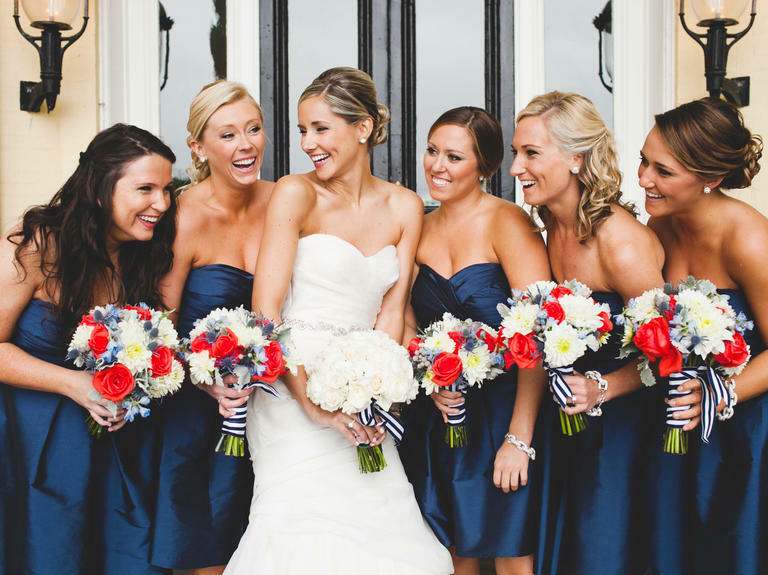 Perhaps this is why the average number of bridesmaids in the US is 4-6 but in the UK it is 3 or less! Where a couple has mixed British and American bridal parties and where budget allows, it is best for the bride and groom to cover the cost of all bridal party attire to avoid hurt feelings and confusion. Where budget allows, the bride and groom should also cover the cost of (or subsidise) travel and/or accommodations for attendants. As some attendants will be traveling from abroad, what will (and will not) be provided financially should be communicated clearly and early so that they can make plans accordingly. An “open bar,” is a bar where the wedding hosts have paid for guests’ drink. This is largely standard practice in the US. In the UK, “cash bars”, where guests pay for their own drinks, are more acceptable. If you invite guests from abroad to celebrate your wedding, and ask them to spend money on airfare and accommodation to be your guest, it is a bit rude to then ask them to continue paying once at your wedding. If a bar is not in your budget, you can reduce your guest list or not serve a full array of drinks. For example, you can limit your bar to beer, soft drinks, and wine only. While this varies hugely based on your venue, what you include in your bar, and how heavy your guests drink, an open bar will average £900-£1,200 per hour for 100 guests. In the UK, most venues and caterers will include a discretionary service charge of 10-12% on food and drink. When booking your venue, make sure to double check whether your quote includes this charge. Although the service charge is discretionary, it should be paid unless you were extremely let down during your wedding. When getting quotes in the UK for wedding services, make sure to check whether the supplier charges VAT and if so, whether this was included in their quote. Otherwise, you may end up with a 20% addition to your bill that you weren’t expecting. 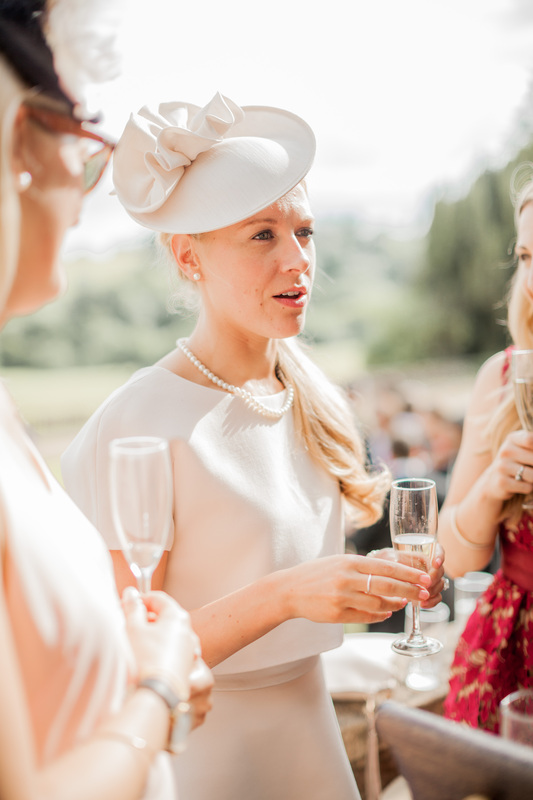 In the final part of this series I will discuss rehearsal dinners and how the actual wedding days differ between the US and UK! If you want more posts like this one, subscribe to the Extraordinary Days blog over on the right hand side! If you are looking for US wedding planner in the UK please get in touch – I would love to help!